Powerline Ethernet is a relatively new concept, that uses the existing electrical wires within a house to deliver wired networking capabilities to different parts of a house. I had been following the development of the standard with anticipation for a few years now, but I was not apparently paying attention as the technology was commercialized relatively quickly. I came upon the commercial implementations anew, when I was looking for a solution to help extend the wireless range of my ageing router. Wireless repeaters were a potential option, but the idea of taking a degrading signal to re-broadcast it was not something that I appreciated for just an aesthetic point of view. Further, that would also constrain the location of the repeater and leave me open to the need for additional repeaters. Enter Powerline networking and in particular a company called TP Link. After a bunch of research, I figured I was not sure if this would even work in my house and was not willing to pay the premium of a recognized brand. 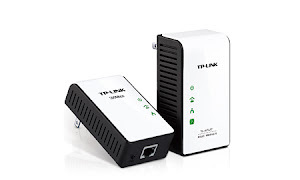 TP Link was a good balance between positive reviews and price. Turns out, using the electrical wires in the house to transmit Ethernet signals is ridiculously easy. You need a couple of pieces of hardware to get things going. The first is the base unit, that plugs into a power socket next to the broadband router. The port on that base unit plugs directly into one of the router ports. This essentially makes the entire home “live”. You then need a client unit, that you can take anywhere in the house and plug into another power socket. Now, on that unit is an Ethernet port that effectively works as a live network port, that can route packets through the electrical wires, through the base unit, the router and out on the the internet. If you were only looking for an extension of your wired network, you are done. If however, you are looking to have the second unit act, also, as a WiFi access point you have additional work to do. The additional work is because the default access point is a cryptic SSID, running an unencrypted signal. I wanted it to have the same SSID and authentication parameters as my original WiFi router, so I could roam upstairs and downstairs between either access point. Figured I'd just configure the TP-Link Powerline client access point that way. And all hell broke loose. TP-Link essentially hard codes the configuration IP of the second access point. The address unfortunately was the same as the base of my home network. This resulted in a few hours of mental and networking gymnastics, just to be able to configure the second access points with the SSID and authentication parameters that I liked. Which brings me to the second point of this post - good core technology but crappy hardware design. The two Powerline plugs were not elegant by any means, but they were functionally simple and effective. But an underlying assumption that one would be OK with default access point parameters, led to some questionable hardware design choices ultimately rendering an otherwise attractive product cumbersome. If only these smaller companies took some of these underlying assumptions seriously enough, there is almost no reason why their products cannot easily compete with the big dogs - in not just the marketplace, but also the social marketplace of the star counts on Amazon.com. Seriously guys, you should just fix it. Officially off stock firmware on all three Android devices at home. 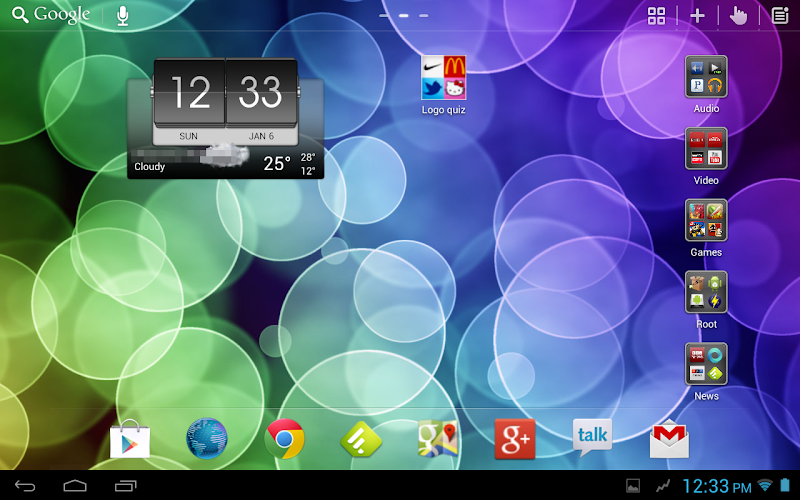 The Toshiba Thrive is running a CyanogenMod 10 build (JellyBean) called Dastardly Dingo. The UI is a Go Launcher HD app. Just as the warranty on the SII ran out, I rooted and upgraded the firmware to the latest JellyBean build. 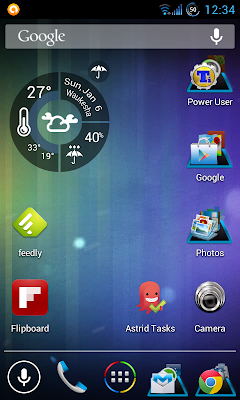 An AOKP JellyBean build. The UI is a Nova Launcher, providing additional functionality to the stock launcher. The final device, a Nexus one, is running Android 2.3.7 (Gingerbread), limited only by it's hardware specs from upgrading to ICS or JellyBean. The biggest difference, of course, is the really powerful Google Now application, that syncs itself across both the JellyBean devices. More details post on Now at some point later, but safe to say, one of the first, well polished, functional and useful personal assistants on today's phones. Whew - all aboard on JellyBean. At around 60 page views a day, I must have reached a 100,000 page views for the site about 10 days ago - December 27th, 2012. It has been a crazy few months, but the blog has been churning out page view on autopilot. I was not even paying attention as this milestone crept up on me and the site. Hang in there, it gets better - is the constant encouragement I've heard over the last few months. And it does, in some ways. And one of those signs of getting better is me thinking about this blog again. But this time, I am planning for this to be a little less social - not private, just not broadcasting. And towards that end, emails subscriptions are shut off and the Twitter updates have been put on hold as well. Over the last few months, I have definitely missed checking in on the site. But more importantly, I am missing keeping a log of some of the things I have been able to sneak in on the side. Hoping I get enough time to get back to this again.